As a lifelong reader, I've always strived to sample a variety of genres. When I was presented with the opportunity to join a sci-fi and fantasy book club (both genres that I normally do not read), I jumped at the chance. 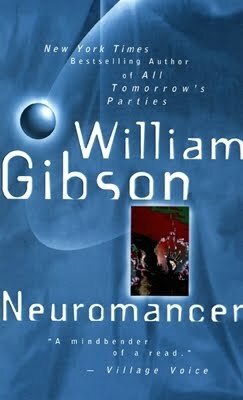 Our first read, Neuromancer by William Gibson seemed like a perfect jumping off point. The novel takes place somewhere in the not too distant future. The protagonist, Case, is an ex hacker/thief whose past escapades have left him physically and mentally damaged. During his last big heist, his enemies destroyed his nervous system, leaving him unable to tap into cyberspace. Without the capacity to carry out his crimes, he spends his days abusing drugs and searching for an end to his miserable life. All of that changes when a group of criminals recruits him for one large heist. They agree to cure his physical maladies in exchange for his expert services. If all of this seems a bit too good to be true, that's because it is. As Case begins to work with the group, he discovers that they are taking on an artificial intelligence that has the potential to destroy the world. Even worse, Armitage, the leader of the criminal group, injected a slow release poison into Case during his nervous system recovery. Now Case is at the mercy of this mysterious organization as he tries to complete the most difficult and dangerous job of his life. This novel is best viewed within the context of its publication. Technology of 1984 was very different from our tech filled lives of today. With that in mind, the world that Gibson imagines is brilliantly drawn and eerily predictive of things to come. He coins the word "cyberspace" and gives life to an imaginative future that inspired works for years to come. In fact, it is probably because this novel was so influential on future works that it seems less groundbreaking than it actually is. Our popular culture has become saturated in futuristic tales, many of which stem from Gibson's work, so it is harder to appreciate the originality of this novel. 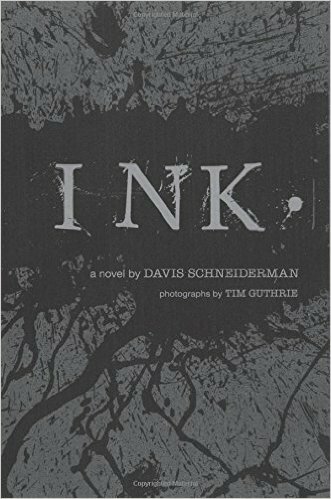 The story slowly unfolds with the plot revealing bits and pieces of itself as the pages turn. I found this style of narrative a bit difficult to follow and to engage in. Still, I can certainly appreciate the influential elements of this novel and am happy to have read it. I was completely enamored with author Emma Donoghue's 2010 novel Room. It was a wildly original story that managed to thrill while still providing an intimate character study. The film adaptation of that novel, from a screenplay written by Donoghue, has already garnered critical acclaim and even been nominated for Best Picture at this year's Academy Awards. With such high expectations, I knew that I was in for a treat. Five-year-old Jack (Jacob Tremblay) has never known of a world beyond the small room he shares with his mother (Brie Larson). The small garden shed that they call home is equipped with the bare necessities: a single bed, toilet, sink, table, wardrobe. A skylight is the family's only view to the outside world. Their only connection to that world is a man they call Old Nick, the man who captured Ma when she was a teenager and fathered Jack. Ma has done her best to shield Jack from the horrors of their life. She plays games with the boy and never lets Old Nick come into contact with him. But Ma knows that she can't shelter her son forever. This life they share is simply not sustainable. Jack is already asking questions about their situation and she cannot keep him in the dark much longer. There is only one thing left for them to do. After seven years of captivity, they must find a way to escape. 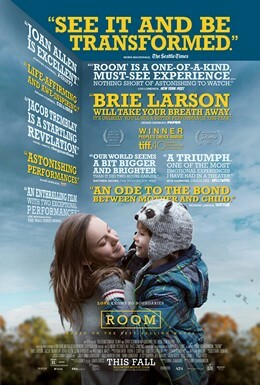 Room is the kind of film that rarely gets made anymore. It is a small, character driven narrative that subtly implants itself into your consciousness. Director Lenny Abrahamson, who directed the under appreciated Frank a couple years ago, deftly gives his actors the space to explore the innermost layers of their characters. Both Larson and the young Tremblay rise to the occasion. Larson in particular gives a nuanced and powerful performance that makes her a safe bet for this years Best Actress Academy Award. This heart-wrenching story about the lengths a parent will go to for the love and safety of their child is a brilliant adaptation of an extraordinary novel and an absolute must see film. "What's a self-respecting amusement park without a ghost?" Devin Jones is looking for an escape. His girlfriend Wendy left him for another guy, and now Devin is finding it nearly impossible to get over her. Everywhere he goes, everything he does, he is constantly reminded of Wendy. Even though she left him for another boy, Devin can't help but imagine what might have been. Determined to leave his past behind, he ends up getting a summer job at Joyland. Joyland is one of those amusement parks from a bygone era. It is the kind of place that used to exist before the big corporate parks like Disney and Universal Studios captured the majority of their customers. Like the many other seasonal employees, Devin is immediately consumed by the magic of the place. The park is filled with a cast of quirky characters who slowly begin to take Devin under their wing. A Stephen King novel wouldn't be complete without a tinge of horror lurking beneath the surface. Devin soon learns of a gruesome murder that occurred in one of the dark rides many years ago. The young woman, whose murder remains unsolved, haunts the ride to this day. Following a cryptic message from Joyland's resident fortune teller, Devin attempts to decipher the meaning and to find more answers about the ghost. This is easily the best novel that Stehpen King has published in recent years. Beyond the horror elements, which have become extremely light compared to his earlier works, King's characters are the crowning achievement of his most successful stories. He casts his tale with engaging and believably flawed people who keep the novel grounded in reality through even the wildest events. 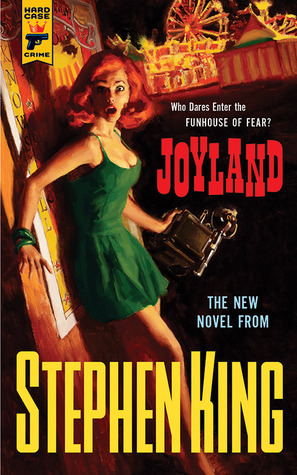 At its heart, Joyland is a coming of age story that reminds us to appreciate our time here on earth. After all of these years, King has evolved from giving us nightmares to teaching us that, "life isn't always a butcher's game. Sometimes the prizes are real. Sometimes they're precious."